**We only rent full weeks in prime season, Saturday to Saturday. Location, location, location AND a pool and hot tub! We sell out every year so dont wait. Our family condo is located beach block on 20th street with just a few steps from the boardwalk and no street to cross to get to the beach. 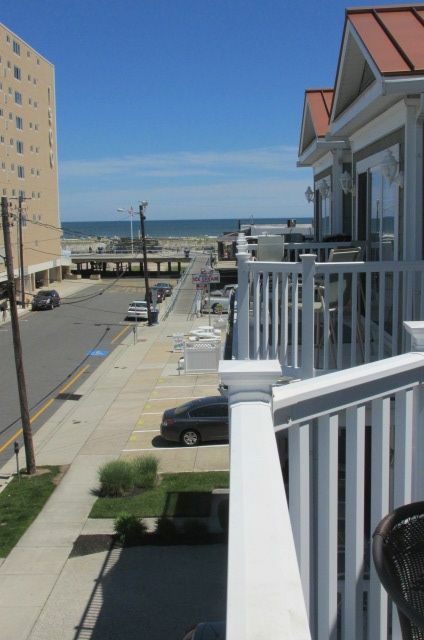 Our condo is also located on the 'short beaches' of North Wildwood. Enjoy your summer vacation on the beach, on the boardwalk, or in the private pool and spa reserved for only owners and tenants of this small condo complex. 20th street is a very family friendly area. Our condo complex includes both full time summer residents and owners that rent their units. Our association has established guidelines that will help ensure that everyone will have a family, friendly environment for all to enjoy. We have a closet full of board games for kids of all ages also! Due to our asthmatic children, no smoking and no pets. Sorry, we rent to families only. Thank you and have a great summer!!!!!!! 2 Reserved spaces in garage. Great location! Loved the condo and everything it had to offer. The owner was great to work with. Location was outstanding. Very spacious unit. Loved the pool and hot tub. Hope to visit and rent again. We were continually pleased from the time we entered the condo, to the day that we locked the doors and left. We were in walking Distance to the boardwalk. The unit was very clean and appealing to the eye. Whenever we had questions the owner was very prompt returning the message. We highly recommend this unit for rental. We will definitely do this again!! My husband and I stayed with our children in July and we couldn't have asked for a nicer place to stay at . The house is AMAZING every detail is perfect, the garage is GIGANTIC and the decks all speak for themselves !!! The pool is kept very clean and the entire complex is very well maintained . As far as location IT IS IN THE BEST SPOT no need to drive anywhere "only food shopping of course" . We can't wait for next summer as we plan to return :) Thanks to Greg for letting us rent his home !!!!!! Pier, along with 3 fantastic outdoor water parks. Fireworks every Friday. Not to mention...........FREE BEACH! is a great place to visit and best of all, it's free.